Ive always wanted to photograph the 2 waterfalls in Kanarra Creek but there are so many amazing spots to visit in Zion that I had never managed to make a visit. On my last day in Zion, Rebecca and I decided to drive to Kanarraville to finally visit Kanarra Creek. 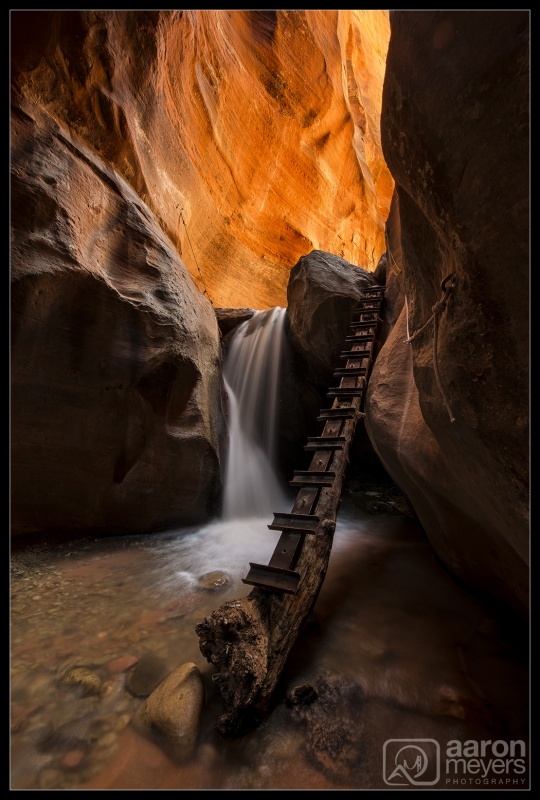 The hike starts out along a dirt trail, starts crossing the stream back and forth a hundred times, until eventually you come to a small slot canyon. The photogenic waterfalls are here. Here you can see the first of two wooden step ladders along the hike. A little bird decided to hang out with us while we sat and photographed here. It would hop from rung to run until it got to the top, hop onto the rock, then fly back to the bottom. That is until we interrupted him to crawl up the ladder ourselves.